This is a developers tool. It is only to be installed locally and not on a live site. Extension Description: This extension for extension developers shows all the core template event locations in the board. 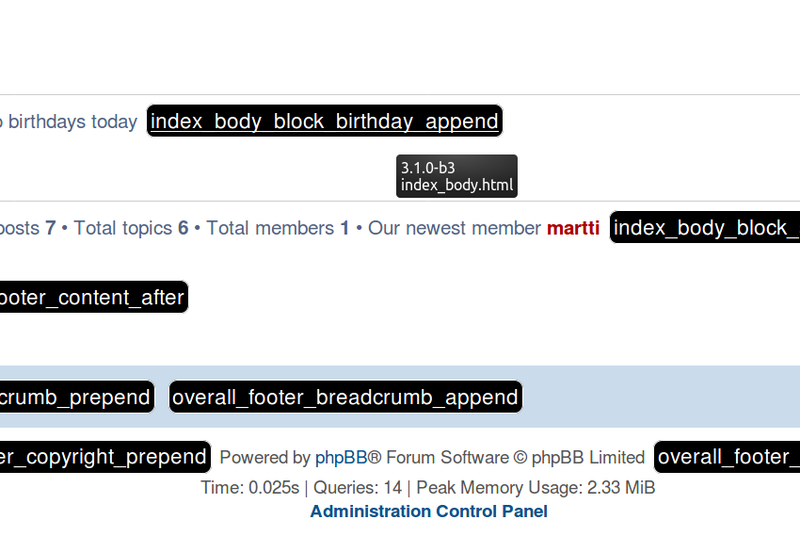 Also the core PHP events that get triggered are shown in order in a table at the bottom of the page. 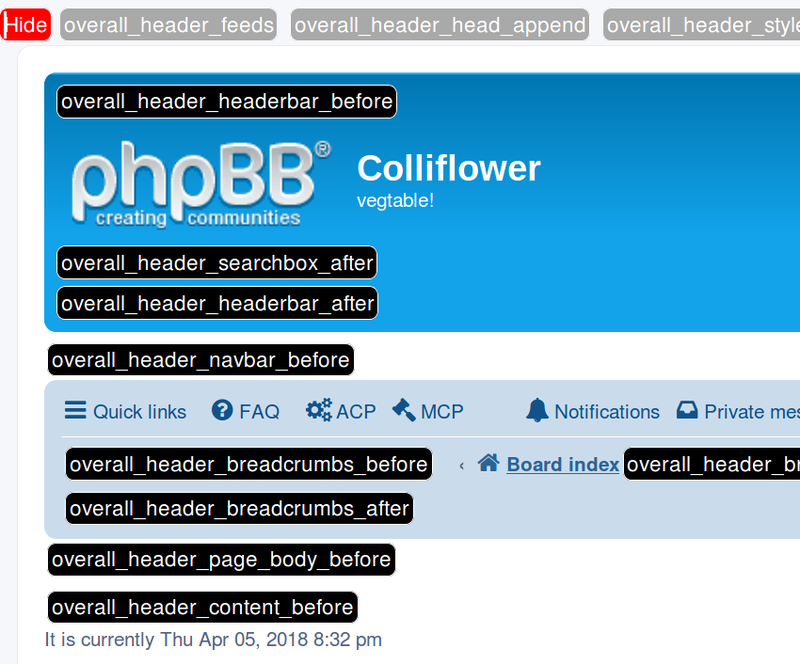 Both the template events medals and PHP events are linked to their location in the phpBB repository in Github so their context can be easily reviewed when you click on them. You can toggle between showing/hiding the events with a button in the upper left corner. Last edited by martti on Wed May 02, 2018 9:22 am, edited 30 times in total. Wow. I'm not an ext dev, but I can see how this will be really useful for devs! Great work! Quite a good idea - but only for a development board. 1. How will this interact with other extensions that may use template events? 2. As these are effectively hard coded will you be updating this extension whenever a new event is added? david63 wrote: Quite a good idea - but only for a development board. 2. For the moment being, this is hard coded. I don't think there is an other solution now. 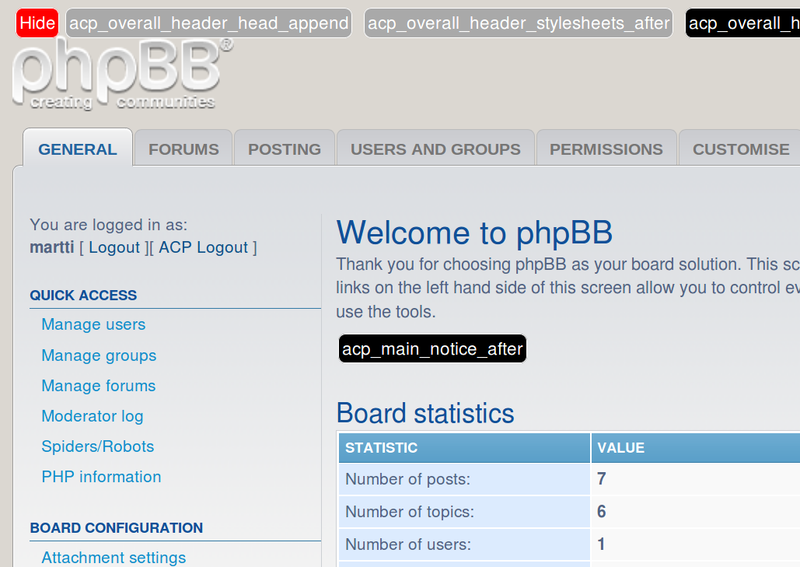 I will update whenever a new version of phpBB with new events comes out. Last edited by martti on Wed Apr 29, 2015 6:33 am, edited 3 times in total. 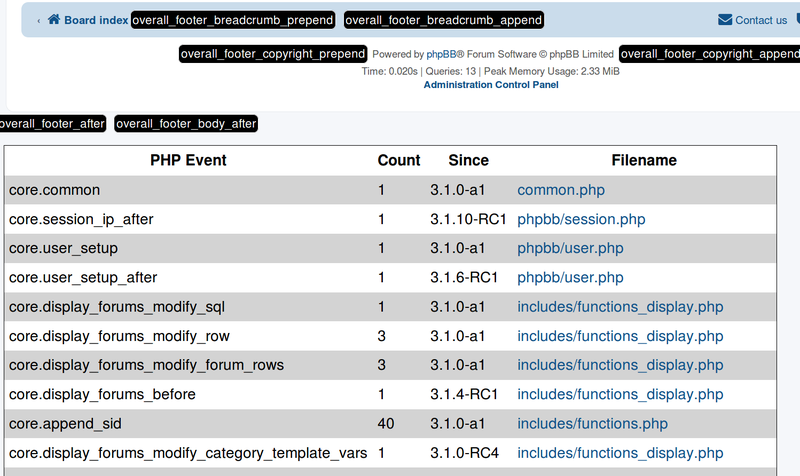 Version 1.0.0-rc1 now also shows the ACP Template Events. martti wrote: Version 1.0.0-rc1 now also shows the ACP Template Events. 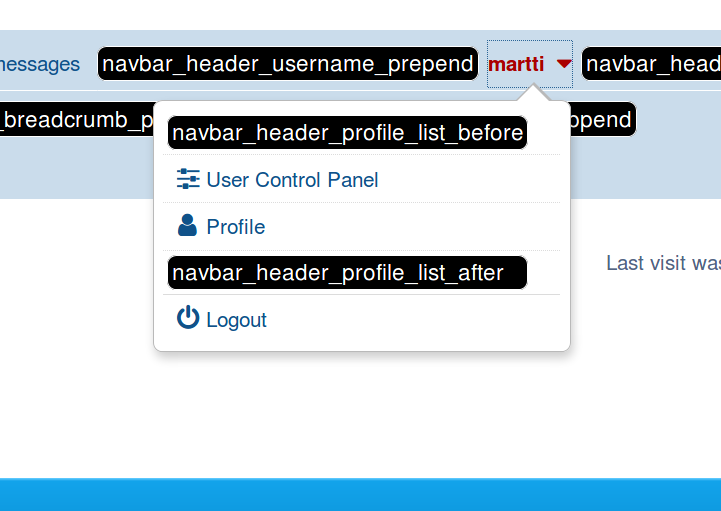 when trying to view the template events in the ACP while in User administration viewing a user, clicking on the show button to view template events, it refreshes the page and drops back to the username input field. any way to set the show template events to just a global on so every time you go to another page it is already turned on? spaceace wrote: when trying to view the template events in the ACP while in User administration viewing a user, clicking on the show button to view template events, it refreshes the page and drops back to the username input field. any way to set the show template events to just a global on so every time you go to another page it is already turned on? 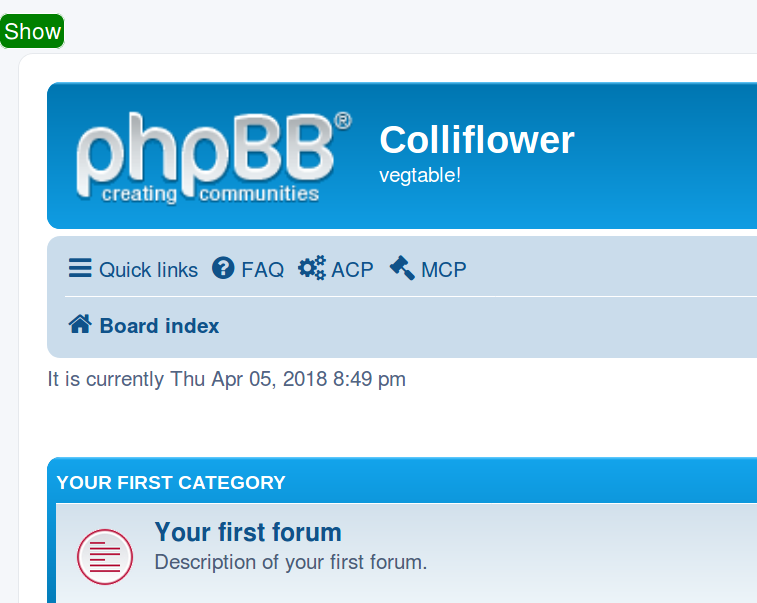 To my view the phpBB core is wrong here and not the extension. This is one of the places the phpBB core uses a HTTP POST where it should be using HTTP GET. You don't see the user represented in the url of the ACP User Administration. If you copy paste the url into another tab of your browser, you won't get the user adminstration of the certain user, but the username input field. Clearly, phpBB should be using here a HTTP GET because no data gets processed; the ACP User Administration is simply a representation of a resource (the certain user). any way to set the show template events to just a global on so every time you go to another page it is already turned on? So, this is already the case (when the showing of template events is turned on, query parameter&value templateevents=1 gets passed over each time in the url). The unexpected behaviour you encounter has to do with the fact phpBB core that doesn't link each page (a resource) to an url. As long this doesn't get fixed in core I suggest to live with it. This looks very useful. Thank you for sharing it - the long text list in the dev guide is okay, but a picture is worth a thousand words! overall_footer_page_body_after should be changed to overall_footer_copyright_prepend. Great extension. Love the work you have put in on this development tool. The German [de] and Russian [ru] translations are ready. I sent them to the extension author. Just sent a pull request to add the new events in 3.1.3 and 3.1.4. Oyabun1 wrote: Just sent a pull request to add the new events in 3.1.3 and 3.1.4.